Pigeons are opportunistic eaters, and their willingness to sample a wide variety of foods makes them relatively common in cityscapes. These flexible birds unquestioningly devour a combination of fruits, vegetables, grains, seeds, insects and waste food, and while their lack of scruples contributes to their population, it can also cause health problems and conflicts within groups. Some species of bird are particular about their diets, but the pigeon isn't one of them. These birds are opportunists who regularly feast on different types of seeds, grains, fruits and vegetables in the wild. They aren't herbivores, though -- they may also prey on small game like worms, insects and snails. With their short, blunt beaks and stout bodies, pigeons aren't particularly formidable birds of prey, so they typically favor vegetation over meat. A pigeon's willingness to eat virtually any type of food he finds makes him a common sight in urban areas. Pigeons are natural scavengers and hang about near groups of people and outdoor eateries in hopes of catching the scraps that fall to the floor. From miniscule crumbs to larger portions, almost nothing is off-limits to the pigeon. Local governments typically discourage purposely feeding these birds, though, as it may cause problems. When pigeons are fed by humans, they generally lose their fear of people and may become nuisances. Feeding may also cause the population to grow unnaturally large, which in turn leads to fighting amongst the birds over resources. 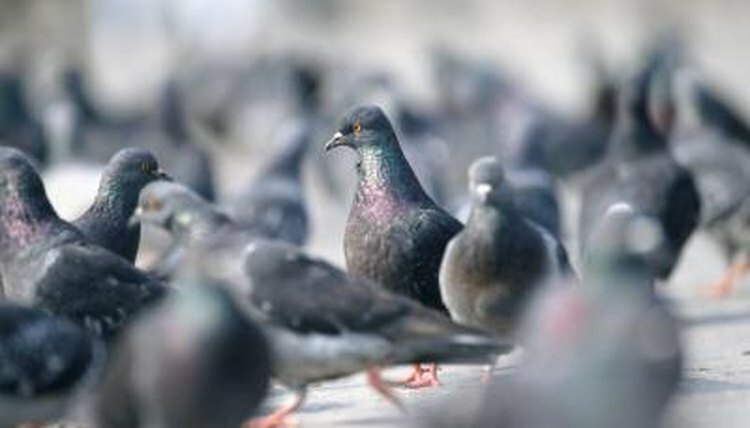 Even in large numbers, pigeons prefer to avoid confrontation, and they feed themselves accordingly. These birds generally stay in large, open areas when looking for food, like town squares, landfills, parks and playgrounds. This affords them high visibility and an easy escape should an apparent threat come near. In urban areas, those threats may include cats, rats and birds of prey like the peregrine falcon. Because pigeons may be kept as pets, competitors for pigeon racing or release doves (which are white homing pigeons), they may also subsist on commercial pigeon food mixes. These seed diets generally contain the variety of grains, seeds and vegetables that optimize the bird's diet and health, as too much "people food" can be unhealthy. To illustrate the difference that this mixed food can make, a pet pigeon may easily live 15 years or more. In the wild, pigeons typically survive only three years or so.